Massachusetts has an incredible variety and quantity of bike trails to offer visiting or resident cyclists. Whether you’re looking for a refreshing ocean ride, a peaceful woodland trip, or a commuter trail in the heart of Boston, there’s something here for you. 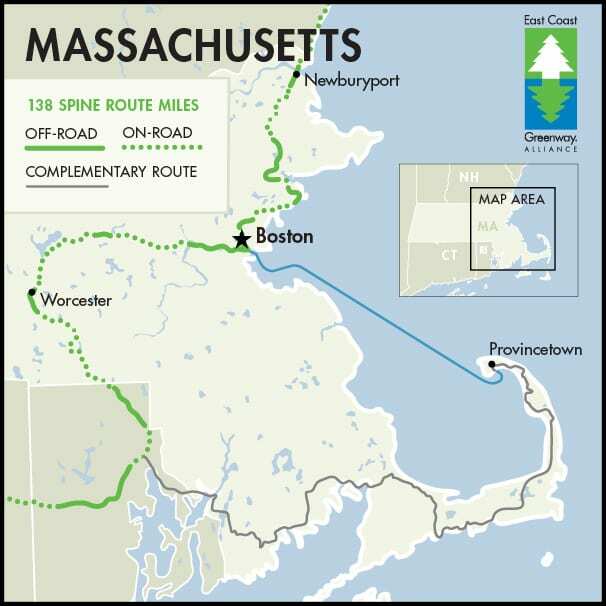 Massachusetts also contains a portion of the East Coast Greenway, a 3000-mile bike tour down the Atlantic Coast that links Canada to Key West, Florida. Our favorite bike trail in Massachusetts is the Shining Sea Bikeway. It is the only bikeway on Cape Cod, a top New England tourist destination, to skirt the shore. This paved path follows prehistoric Wampanoag Indian trails, offering beautiful views of woodlands, marshes, salt ponds, and expansive seascapes to the observant cyclist. It is perhaps the most scenic bike trail in the entire state. If you know of (or have ridden and created) a more accurate one-way route on RideWithGPS for any of these Massachusetts bike trails, please let us know so that we can improve this page. Of the trails included in the list above, the following are currently part of the East Coast Greenway. The mileage counts reflect the portion of each trail that is on the Greenway.